If I had a nickel for every time I’ve heard someone ask me in the last year and a half why we didn’t add an intermission to a show, I’d be rolling in a solid $10 right now. This isn’t typically a producer’s choice to make. These scripts are written this way but usually, and despite my best efforts to explain, I just get told that we should have added one anyway. So, in gearing up for The Moors, a 90-minute play with no intermission, I asked Garret Storms to discuss this contemporary trend. When it comes to intermissions, we are in a very interesting moment. In today’s world, where technology is developing at such an astoundingly rapid rate, the pace of our lives is also quicker. We are looking for the things that we invest our time and money in to be efficient and bite-sized, yet still retain the full, complete, and satisfying experience that we’ve always known and relied on. 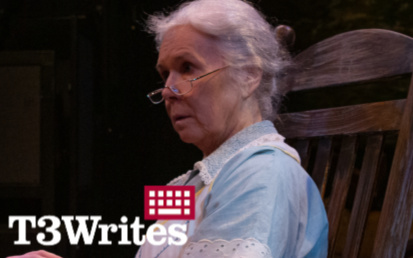 There are an incredible amount of young playwrights across the country and world writing scripts that come in at the 90-100 minute mark – a run time that usually does not require an intermission. Traditionally, shows that have an intermission will leave the audience with a quick surge or swell in the action at the end of an act, whereupon returning to the next act the actions dips down a bit in order to rebuild to the end of the show. But some playwrights today are tending to write in the rhythm at which the world moves today – quicker and more condensed. And that is not at all to say that these plays are reductive or superficial or any less engrossing. On the contrary, these scripts simply have a different sort of structure. As is true with The Moors, what playwright Jen Silverman does is start with plot. We do not get much exposition at all – this allows us to get straight into the meat of the story, and also serves her purpose to create a world that we have to learn how to navigate without being eased into it – there is an air of mystery and intrigue that she creates by requiring us, as the audience, to dive in head first. In the past, intermissions served an important tangential function of the social aspects of attending the theatre. They were a means by which patrons could people-watch, see and be seen, and engage in discourse and discussion about what the second or third act might bring. This is a charming, yet admittedly somewhat antiquated notion now. Going to the theatre then was an event in a different way than it is now. As dress for the theatre has become a bit more casual and less of a people-watching spectacle, and with our devices in hand, we find the need to fit more and more things into our days, shorter shows without intermissions allow us time to get a bite to eat after the show or go out for drinks, where we then discuss the show. The social aspects are still there, they are simply restructured a bit in order to fit the pace at which we live life now. Intermissions have lost a fair bit of the appeal that they had in the past – the expectation now is that intermission is basically time for patrons to form a slow-moving line towards the porcelain. That is not to say though that they are not still valuable today. For example, while contemporary playwrights certainly still use and write intermissions into the structure of their scripts, we are also in a time where we are seeing many, many classics being restaged and reinvestigated in the theatre. These classics due to the time in which they were written, require an intermission, due to length, or scene changes for actors and crew. With these scripts, intermissions also give the audience a bit of time to process the play before moving on to the next act. This again has to do with the way a play is structured. We tend to think of intermissions as a given when going to the theatre, but more and more we are seeing scripts without the use of them. We are consuming stories in new and interesting ways today – we are playing with form and challenging our notions of rules and structure. Ask any theatre producer, and they will tell you that there is a certain appeal to a show without an intermission. In regard to The Moors, it feels right not to have an intermission; not only because it is a relatively short show, but also because it would interrupt the momentum of the story. It would also allow the audience to escape the world of the play, and part of the point is that the world of this play is not so easily escapable.